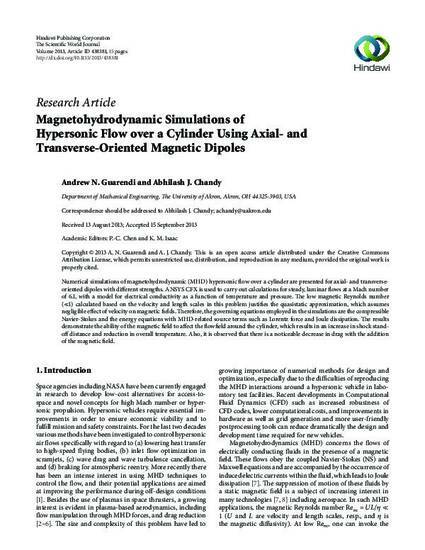 Numerical simulations of magnetohydrodynamic (MHD) hypersonic flow over a cylinder are presented for axial- and transverse-oriented dipoles with different strengths. ANSYS CFX is used to carry out calculations for steady, laminar flows at a Mach number of 6.1, with a model for electrical conductivity as a function of temperature and pressure. The low magnetic Reynolds number (≪1) calculated based on the velocity and length scales in this problem justifies the quasistatic approximation, which assumes negligible effect of velocity on magnetic fields. Therefore, the governing equations employed in the simulations are the compressible Navier-Stokes and the energy equations with MHD-related source terms such as Lorentz force and Joule dissipation. The results demonstrate the ability of the magnetic field to affect the flowfield around the cylinder, which results in an increase in shock stand-off distance and reduction in overall temperature. Also, it is observed that there is a noticeable decrease in drag with the addition of the magnetic field.